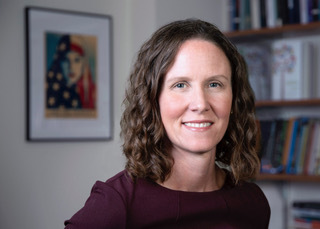 Justine Howe specializes in contemporary Islam with a focus on Muslim communities in the United States. Professor Howe joined the Department of Religious Studies in Fall 2013 and is a core faculty member in the Women’s and Gender Studies Program at CWRU. She holds a PhD in Religious Studies from Northwestern University. Her first book, Suburban Islam, was published with Oxford University Press in 2018. The book examines the role of ritual, leisure, and reading practices in an American Muslim “third space.” Professor Howe’s publications in the Journal of Quranic Studies (2016) and the Routledge Handbook of Early Islam (2017) analyze the effects of ideologies of religious pluralism on American Muslim comm unities and scholarship on Islam. Professor Howe is the editor of the Routledge Handbook of Islam and Gender, which is forthcoming in late 2019. The volume will feature 30 original essays related to various dimensions of gender and sexuality in global Muslim contexts. She is also at work on her next book project, Muslim Students and the Making of American Islam, which examines the seminal role of the Muslim Students Association (MSA) in shaping the direction of American Muslim communities. Focusing on the MSA’s growth from its founding in 1963 until the present, the book will locate American Muslim students within the larger history of transnational political and religious activism in the United States, a history in which they have mainly been absent. Professor Howe has received numerous grants and awards, including her recent selection as a fellow in the Young Scholars in American Religion program at the Center for Religion and American Culture at IUPUI, a Faculty Fellowship from the Baker-Nord Center for the Humanities at Case Western and an AAR Individual Research Grant. She teaches a wide range of courses, including Introducing Islam, Islam, Gender and Women, the Qur’an, religion and empire, and theory and method in the study of religion. She currently serves as co-chair of the Islam, Gender, Women unit at the American Academy of Religion.